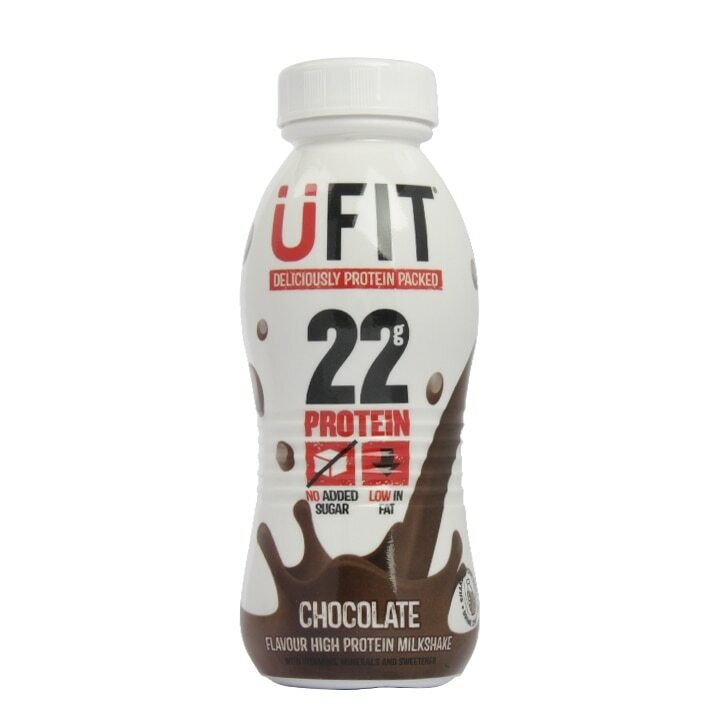 UFIT is packed with 22g of protein goodness with added fibre, calcium, vitamins and minerals. Made from milk protein, UFIT is designed to support the demands of an active lifestyle and can help in the building and maintenance of hard working muscles and bones. Bursting with 22g grams of essential protein, UFIT comes in two great tasting flavours - strawberry and chocolate. Each drink is 310ml. Adults over 18 may consume 1 to 3 bottles per day, to be taken in between meals as a nutritious snack or following exercise ro activity. Skimmed milk, Water, Whole milk, Milk Protein, Dietary Fibre, Fat reduced cocoa powder, Vegetable oils (Sunflower, Corn) , Beta glucan, Trisodiumcitrate, Stabilizer: Carrageenan, Dextrose, Salt, Flavour, Sweetener: Sucralose, Vitamins & Minerals: Sodium ascorbate, Vitamin E acetate, Sodium selenite, Vitamin D3. Women who are pregnant or lactating should consult their GP before using UFIT. UFIT Protein Drink Chocolate is rated 4.8 out of 5 by 6. Rated 5 out of 5 by Vickieonfire from Love this stuff! I have it before or after the gym to perk myself up and it's brilliant. Gives me the energy I need without the extra calories and the chocolate one tastes amazing! Just wish my local store had this in stock so I don't have to order online all the time!! Rated 5 out of 5 by jules51 from So Impressed I bought some more. Bought in the half price sale. Just perfect for the gym or after exercise, or just if I haven't time for lunch. Much cheaper than anything similar on the market.